Registrar and Chief Executive Officer of Joint Admissions and Matriculation Board, JAMB, professor Dibu Ojerinde has said that only 60, 000 of the 498, 000 candidates who sat for this year's examination into various tertiary institutions, have been offered admission into institutions of first choice. The remaining 438, 000 will have to try again next year. Sad! Linda where d hell did u get dis figures from??? They can't be right, first of all more than 1 million people took d jamb exam dis year not ur 400k plus number! Secondly we hav close to 200 universities in nigeria including federal, state and private, and if they averagly admit 1500 candidates, total candidates offered admission should be in d region of 270,000 or more... U mere 60k is ridiculous!!! I'm off to Madonna Uni..............F*ck Jamb, F*uk d registrar. They just want to sell more Forms and admit less people nxt year..FOOLS!!! President Goodluck Jonathan-led Federal Government has not shown any clear-cut policy direction, with regards to a number of issues, Nigerians must make it a duty to demand explanations and accountability from those who lead them. It is no longer a secret that the Jonathan presidency lacks colour, style, ambience, aura, charm and charisma. It also lacks the courage and experience to midwife the challenges confronting us as a nation. From poor education and decrepit health facilities to decaying infrastructure and backward-looking economy, the nation is being bogged down by the burden of non-creative and phlegmatic leadership. Our schools are in shambles, security situation is remorseful, and unemployment rate has sky-rocketed. It is instructive to note that the country truly needs an experienced and courageous leadership to contend with the numerous challenges, particularly in the face of ongoing economic problems and misplaced priorities. Every Nigerian desires good governance and accountable leadership, but the Jonathan administration is yet to show any policy direction and sense of purpose. At best, the actions of President Jonathan are further deepening the level of poverty and want in the society. May God help us especialy now they want to increase fuel price or removal of subsidy. The govenment must reform our education sector, only if they want peace in nigeria. The youths they abandoned today may be their killer tomorrow. Our past leaders created so much problems to our social and educational system. Haha this is a pic of my high school, LJC Abuja. Linda Ikeji woman, where did you get this pic? Hilarious! Those were my class mates during an art class I believe. How on earth did you get this pic? Meanwhile, schools are to blame for this JAMB thing. 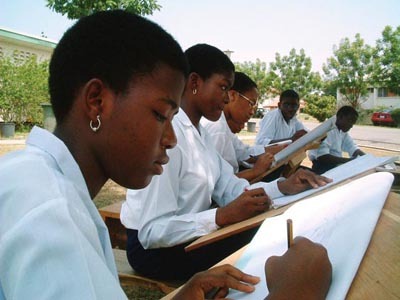 The school curriculum doesn't always cover topics JAMB focuses on. Students keep complaining but no one is doing anything about it. Plus even if you pass JAMB in flying colours you may still have to kiss smelly old asses to get admission. Stupid. Then they wonder why we go abroad. Linda please what source did your picture for this story come from? I know it is NOT a picture of this year's students writing JAMB. Sensationalism. First choice. Lots of others go to sec/third choices. @ anon 10.18 pm, why must the picture be of JAMB students of this year? The main point of this article is the story and not the picture. linda wey my post naaah ????? Rihanna dating British boxer and model, Dudley? Bhaira Mcwizu expecting first baby?